Some games just take longer than others. The Forest Grove Vikings notched their first Pacific Conference win of the season, defeating Liberty 2-1 Thursday, April 4, at Ron Tonkin Field in Hillsboro, in a game that was postponed due to rain in the second inning two days prior with the Vikings leading 2-0. The Vikings' Rhett Larson continued Thursday where he left-off Tuesday, stifling Falcons hitters en route to a complete game three-hitter. Larson's combined seven innings included zero earned runs, four strikeouts and three walks. "Rhett Larson has grown tremendously from his freshman year to now," Forest Grove head coach Justin Engeseth said. "He's opened up from a personality standpoint and I think it's helped him flourish on the mound. He's open to trying new things, and working on a three and four pitch repertoire." 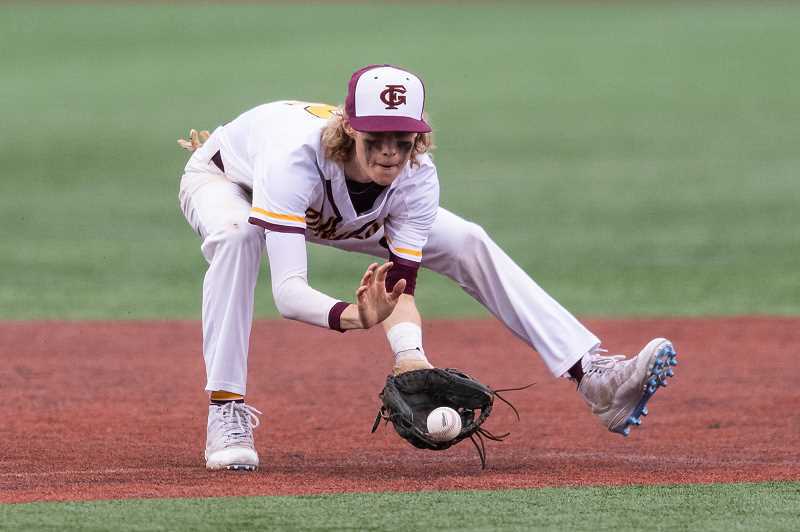 Forest Grove did little at the plate on this night, tallying just two hits off of Liberty's Jacob Hoskins who took over for Ben Ineson, who had allowed two runs on two hits with two strikeouts and a couple of walks to start the game Tuesday afternoon. But what they lacked offensively, Larson made up for on the mound with a variety of pitches and the ability to locate them early and often in counts — something they didn't do in a 10-6 loss to Liberty a night earlier. "We battled, persevered, threw strikes and got ahead of hitters, which was a complete 180 from our previous game with Liberty," said Engeseth. "The big thing for us going forward is to play with the same confidence that we play with when (Rhett) Larson is on the mound, as we do with any other of our five or six guys." J.J. Buehler got things going for Forest Grove in the bottom of the first with a four pitch lead-off walk. Then, after Buehler was thrown out at second on a Max Richards fielder's choice, Henry Tonges singled to right to put runners on first and second before a Brendan Couture walk loaded the bases for Spencer Jones, who singled to right field, scoring Richards and Tonges for an early 2-0 lead. Shortly thereafter the game was postponed due to rain, but when they picked it up again two days later it was all Larson and Hoskins, with neither offense posing much of a threat until Liberty's half of the seventh. The Falcons appeared to be going quietly after a Jake Woodbury ground out to start, but when an error put Joseph Depinto on first, a balk moved him to second, then a second error put runners on first and second with still but one out, things were looking up for Liberty, while the Vikings' position was weakening by the second. 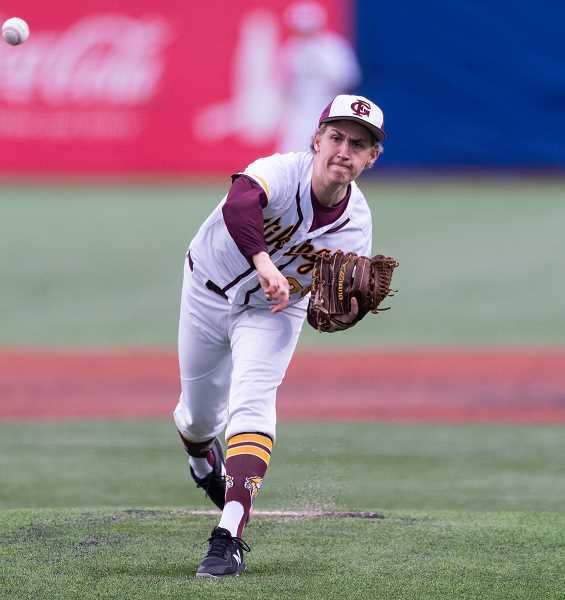 But Larson would have none of it, and after a quick Engeseth visit to the mound, the Forest Grove ace finished the Falcons with a game-ending double play. "The kid (Larson) is a rock and is ready to battle," Engeseth said. "The balk call could've rattled a younger guy, but he's been there and he kept attacking. When I went out to talk to him after the first error, we just talked about settling down and starting over with our approach. For him, he doesn't take that as pressure, but more as a challenge." The same two teams were set to play the final game of their three-game set April 5, but were washed-out and forced to reschedule for 5:00 p.m. Monday, April 8, at Forest Grove High School. 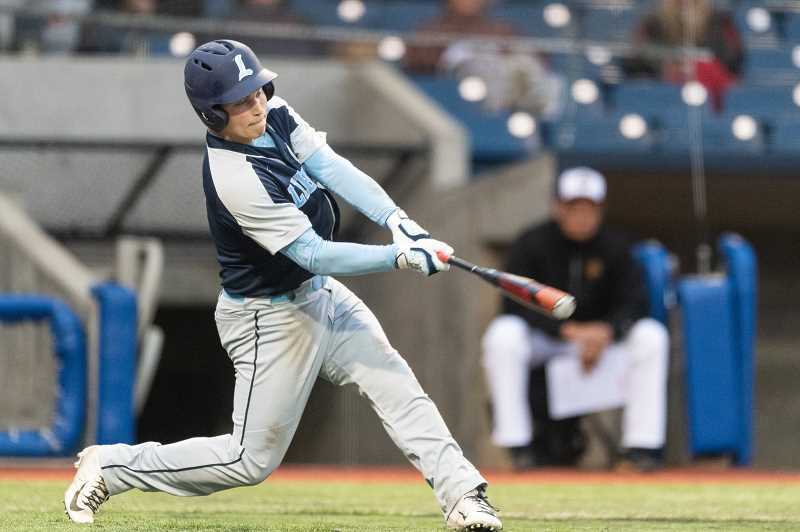 Beyond that the Vikings will start a three-game series with Sherwood, April 9, while Liberty takes a break from conference play before hosting the first of a three-game set with Century Tuesday, April 16.